Posted in Travel Health on October 6, 2011. Last modified on January 31 2018. Read disclaimer. Most people will take a vacation away from home at some time during the year. And many of us are choosing to take a pet along, rather than boarding or hiring a sitter. Whether you travel by car or plane with your pet, there are safety and logistical considerations for both types of transportation. Motion Sickness: Car travel can make your pet nauseated, especially if they are not used to riding in the car. To relieve motion sickness in your pet, do not feed heavy meals, especially two hours before and during travel. Opening a window a crack to let fresh air in will help your pet deal better with motion sickness. Because there is less motion in the front of the vehicle, try putting your cat or dog in the front passenger seat to minimize motion sickness. Potty Breaks: You should stop every 2 to 4 hours for a few minutes to allow your pet to stretch and go to the bathroom. Many rest stops have grassy areas for letting dogs exercise on leash. At the time of the break you can offer water and physical support such as petting to help calm your pet during travel. Sedation: Sedatives can help your pet seem more relaxed during the trip, but there are side effects that you should consider. One of the side- effects is that your pet will be less responsive to the environment and his or her senses will be dulled. From a safety standpoint this is important to take into consideration. Some sedatives will also cause constipation, thirst, or even nausea. Be sure you know how your pet will react to a sedative before you leave for the trip. Better yet, do not sedate your pet unless it is absolutely necessary. 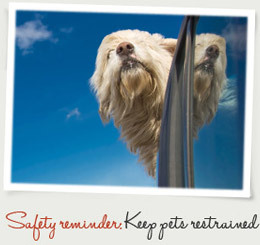 Heat concerns: Never leave pets in vehicle unattended -- even for just a few minutes. Not only is there a chance that the vehicle may be broken into, allowing the pet to escape or be stolen, but temperature is also a major concern. In just a few minutes, the temperature inside a parked vehicle can go from comfortable to extreme heat EVEN WHEN THE TEMPERATURE IS COOL OUTSIDE. According to the journal Pediatrics, even on cool days, the sun coming through vehicle windows creates a greenhouse effect and can elevate inside temperate over 30 degrees in just a half hour. The resulting heat can quickly cause heat illness, dehydration, brain damage and even death for pets (or humans). Pet restraint: Just as adults should use seatbelts and children should be restrained in child car seats for their protecting in the event of a sudden stop, swerve or accident, pets should be restrained at all times. Restraint also prevents an opportunity for them to bolt out of an opened vehicle door or window, especially if they become frightened. Pets allowed to move about freely within the vehicle may also distract the driver and increase the chances of an accident. Pet restraints, car seats are good options while wire cages or plastic crates provide restraint as well as protection from falling objects. Under the seat or in Cargo? If you are traveling with a small dog (20lbs or under) or a cat, you may take an airline approved pet carrier that will fit under the seat. If your dog is medium or large, it may have to ride in the cargo compartment. Be sure the carrier or crate you use to put your pet in the plane has a bowl of fresh water and soft blankets that remind your dog of home. Cargo can be stressful due to loud noises and temperature fluctuations. Check your pet frequently: The staff of the flight should know that your pet is in the hold and be able to monitor its welfare throughout the flight. If an unusual circumstance occurs, the flight crew can help you take care of your pet. Long taxi times on runways, delayed flights, rushed connections, and other situations can be stressful for you and your pet. Having help form the flight crew in these situations is vital to a successful trip with your pet. Walk your dog: If you have a layover at an airport between flights, take your dog to the bathroom. Most airports have a dog-friendly area just outside or inside the terminal where you can walk you dog and he can do his business between flights. Put your pet in a quality crate: The crate you put your pet in while traveling should be large enough for it to turn around in. The crate should meet transportation safety requirements. Identification: your pet should wear his/her ID tag and the pet's name and description along with the owner's name, phone and address should be attached to the carrier, if one is being used. Appropriate health papers required for travel to your destination. Water: distilled or purified water may help to prevent stomach upset. Prepare yourself and your pet in advance: Make sure your hotel is pet friendly in advance of the trip. Research and have the information about emergency animal hospitals located near your destination. Hawaii and abroad: Traveling outside the US may require more health documentation. Consult the appropriate country's embassy or consulate at least a month ahead of traveling to be sure what you need to go through customs with your pet. If you are traveling to the state of Hawaii check entry requirements for your pet as if you were traveling abroad. We made the mistake of trying to sneak our beloved little doxie into the hotel room and what a disaster! They must have had hallway cameras because the next morning at checkout, the desk clerk hit us with a fee of a couple hundred dollars. When we argued, he went ahead and charged our credit card anyway, without our approval. That was an experience we never hope to repeat. Since then, we're constantly on the lookout for Extended Stay properties or, as a fall back, Red Roof Inns and Motel 6s whenever we travel. As far as we've found, these chains always seem to be pet friendly.